The ongoing economic crisis in developed nations is the worst since the Great Depression1 ,2 and Greece is thought to have been more affected than any other European country.3 Numerous academic articles and commentaries have been published in recent years speculating about the impact of recent economic austerity measures in Greece.1 ,3–5 These austerity measures followed numerous economic inconsistencies in the national finances of the Greek state that have been viewed as a foundational economic crisis affecting the European economy and, by extension, the world economy. The weight of this crisis situation and the Greek austerity measures have been highly publicised around the world. Not surprisingly, this publicity and the toxic economic conditions accompanying the austerity measures have also become the leading source of public consternation in Greece itself, exacting considerable stress and strain on the Greek public.1 ,4 Everyday citizens in Greece have faced an increasingly bleak crisis and their local media outlets discuss little else. National debt reduction strategies and new austerity measures are publicly, and often abruptly, announced and then followed by large demonstrations, labour strikes, riots and police actions. The strain on the Greek public that has persisted for several years now has prompted academic discussion of the potential health effects of the austerity measures. In this regard, fluctuations of suicides in Greece have been a lead topic of discussion, with numerous commentators concluding that the recent austerity measures have indeed led to increased suicides in Greece. This conclusion has, however, been appropriately met with scepticism6–8 and no large-scale, systematic longitudinal analysis has yet been completed to inform the ongoing debate as to whether austerity measures have led to statistically higher suicide rates in Greece.4 ,6 ,7 ,9 ,10 To help fill this gap, we undertook a 30-year interrupted time-series analysis of several abrupt and highly publicised austerity-related events and the monthly occurrence of suicide across Greece. For comparison, we also considered the impact of prosperity-related events and suicide across Greece over the same time period and investigated the potential bias of suicide under-reporting on our analyses. Given this potential for misclassification, we performed a sensitivity analysis based on prior work, including a comparison of official suicide mortality statistics from ELSTAT and validated coroner death certificate data for the same suicides at the regional level (the Island of Crete).24 Discrepancies between the two sources indicated that suicidal poisonings, falls, drownings and hangings most likely represented the vast majority of potentially misclassified suicides. In all instances of misclassification, suicides were undercounted; suicides were not overcounted in any mechanism of suicide category. The remaining mechanisms of suicide were either very infrequently undercounted (ie, firearm suicides) or very small in number (ie, cutting/piercing suicides) and excluded from further sensitivity analyses. Several study limitations deserve comment. 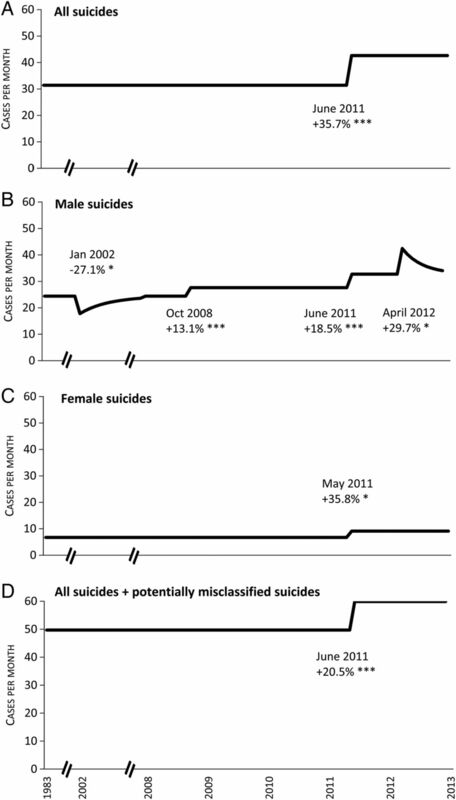 Prior studies have pointed to the misclassification of suicide as a clear source of bias in national analyses.14 ,19–21 This is a particular issue for Greece where religious and other reasons potentially drive under-reporting of suicide.14 However, it has also been shown that when comparing suicides with the patterns of accidental falls and poisonings in Greece, a large-scale misclassification masking of the true suicide rate is unlikely.7 The results reported here also appear to be minimally affected by this misclassification bias; our sensitivity analyses accounting for suicide under-reporting maintained the same basic findings. 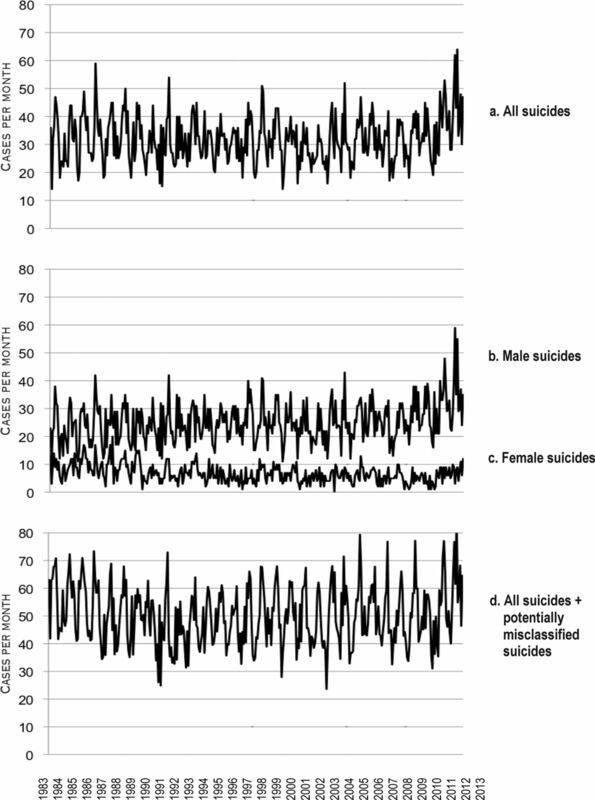 Future studies might, however, conduct additional sensitivity analyses of suicide misclassification separately for men and women. Stuckler D, Meissner C, Fishback P, et al. Banking crises and mortality during the Great Depression: evidence from US urban populations, 1929–1937. J Epidemiol Commun H 2012;66:410–9. Anonymous. Regulation of the Statistical Obligations of the Agencies of the Hellenic Statistical System (ELSS). Piraeus: Hellenic Republic. Hellenic Statistical Authority; 2011:1–8.
. Suicide misclassification in an International Context. Paper presented at: Proceedings of the International Collaborative Effort on Injury Statistics; Hyattsville, Maryland, USA, 1995.
. Financial crisis and austerity measures in Greece: their impact on health promotion policies and public health care. Health Policy 2013;13:154–68.
. Timeline: Greek austerity strikes and protests. International Business Times. Nov 6, 2013. Anonymous. More riots in Greece over fatal police shooting of teen. USA Today. Dec 7, 2008.
. Time-series analysis: forecasting and control. San Francisco: Holden-Day, 1976.
. Investors shun Greek debt as shipping crisis deepens. The Telegraph. October 2008.
. Suicide by firearms on the island of Crete. Crisis 2010;31:43–52.
. A different perspective on the UCSB mass murder. Violence Gend 2014;1:49–50. World-Health-Organization. Preventing suicide. A resource for media professionals. Report-of-WHO-Department-of-Mental-Health-and-Substance-Abuse. Geneva, Switzerland: WHO Library; 2008:1–18.